Can People With Type 2 Diabetes Eat Oranges? Oranges are a healthy citrus fruit, but if you have type 2 diabetes, you may worry about their high sugar content if your blood sugar levels are out of control. Fortunately, oranges contain components that make them a nutritious part of a diabetic diet as long as you eat them in concert with other healthy foods. People with type 2 diabetes cannot properly modulate blood sugar levels because they either don't produce enough insulin or their bodies can't effectively use the insulin they do produce. Type 2 diabetes is the most common form, making up between 90 to 95 percent of all diabetics, according to FamilyDoctor.org. The food that a type 2 diabetic eats can significantly affect blood glucose levels, so choosing the right foods is important. Fruit can and should be part of a diabetic's daily diet. Diabetics who eat between 1,600 and 2,000 calories per day need to eat at least three servings of fruit per day. Those consuming 1,200 to 1,600 calories need two fruit servings daily, according to the National Diabetes Information Clearinghouse. The fiber, vitamins and minerals in fruit are essential to maintaining overall health. Because fruits provide carbohydrates, you usually need to pair them with a protein or fat. Oranges provide high levels of fiber, which is important for digestive health, and vitamin C, which supports the immune system. 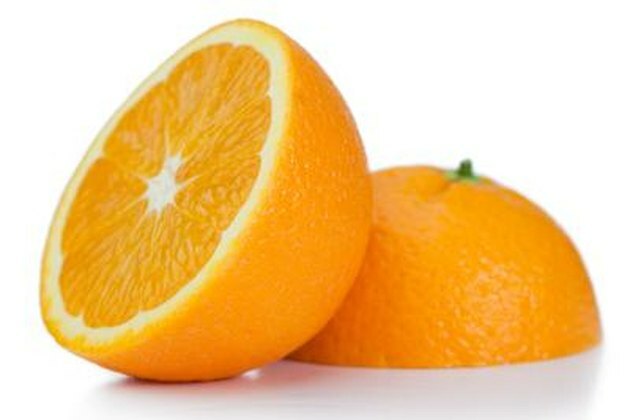 The carbohydrate count in one orange is about 10 to 15 g. For diabetics using a carbohydrate-counting system to determine how much they can eat in a day, an orange is one serving. For diabetics using the glycemic index or glycemic load of foods to plan what they eat, oranges are also a good choice. The glycemic load of an orange is about 5, a low number that indicates the fruit causes only a small rise in blood glucose. The fiber in oranges helps modulate blood sugar by slowing absorption into the bloodstream. Most diabetics can eat about 60 g of carbohydrates at each meal, so you'll have to keep track of the other carbohydrates you eat in order to determine whether you can include an orange at any given meal. You should try to include oranges in your diet at least a few times a week, though, since they are an excellent source of nutrients. What Are the Effects of Grapefruit on Diabetes?